In this post, I just want to quickly share with you how to create an online course description on Udemy. I have recently built an online course on Udemy – a WordPress Beginner style course. I was trying to figure out what title to use and have taken your feedback from the Facebook group. I’ve integrated it as I do want the course to also focus on personal branding because it’s something that I’ve been working on for several years. It’s something that I have experience with in the WordPress realm. So, I’ve come to – WordPress Made Easy: Plan, Build, and Launch Your First Website for Your Personal Brand in 1 Hour. Now, one thing I really love about Udemy is that it walks you through the process of outlining your course while you’re creating the description whether you realize it or not. How do you create an online course description on Udemy? 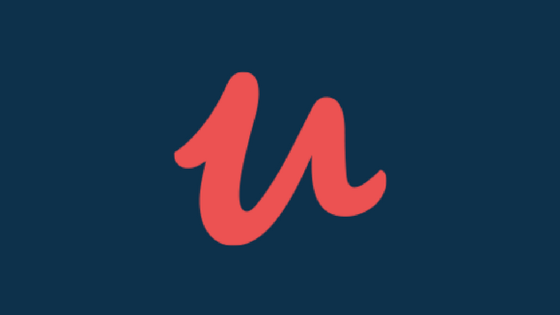 What’s really great about Udemy is you can use tags to plan out the rest of your description and to serve as a high-level overview of the contents of your course. This is actually one of the guide questions on Udemy when you’re planning out your tags. In my case, WordPress is definitely one of my tags. Then, I also have personal branding since I also tackle the key elements of personal branding and how to incorporate those to your personal website. I also have the user experience design or UX design tag as my course includes how to leverage UX design principles even if you’re not an expert designer. It also includes how to leverage this approach to designing and planning your site without even touching code. I also have the marketing strategy tag since it goes hand-in-hand with UX design. There’s some overlap there based on how you lay your site pages out and incorporate your marketing strategy into it. 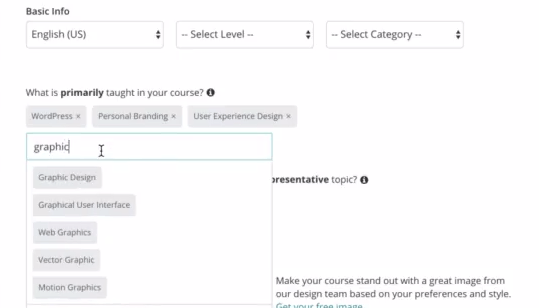 Planning out your tags helps you think about who you’re serving, your course content, and how they match. One great thing about Udemy is it pre-populates potential tags you can use when you start typing in a keyword. So, it’s easier to get ideas on what tags you should use based on what you’re covering in your course. Now, based on your tags and keywords that you have planned out, you can then create your title and subtitle. This may also need to involve keyword research outside the platform. In my case, I’ve decided to create a poll on my Facebook group to help me settle on a title for my course. Online communities can really help you gain a lot of insight when it comes to creating your title. When creating your title/subtitle, remember the focus of your course. What is the main content of your course? What value does it deliver? Who would benefit most from your course? Chances are, you’ve already thought about these when creating your tags. Remember though that Udemy set a limit of 60 characters for each of your titles. When writing the course description, there are several questions it must answer. Who is your target enrollee? What value can you give to your potential student? Will it help a particular field or niche? What are the main benefits of your course? What will your course cover? Why should they choose your course over other similar courses? 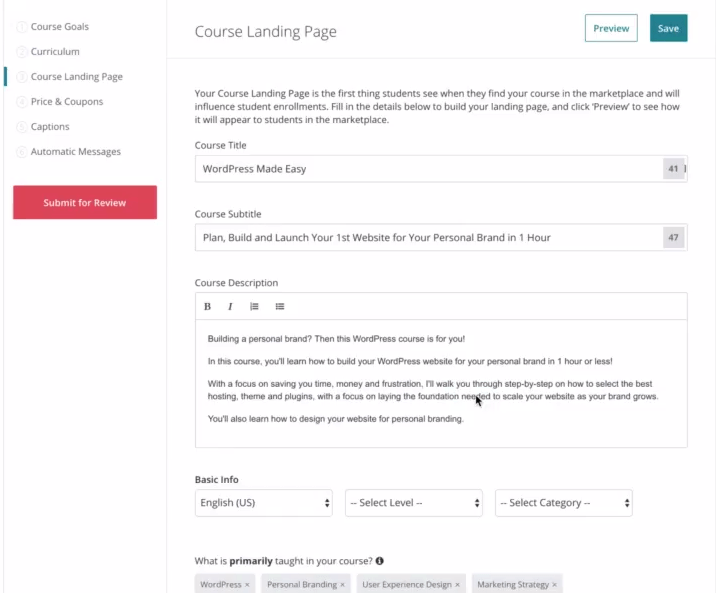 It will be great to also incorporate some of your major keywords into your course description to help potential enrollees find it and also to drive home the focus of your course. In my case, I’ve got some keywords in there for personal branding and WordPress. It’s not just for people who are looking to create WordPress sites. WordPress is so universal when it comes to website building. You could be a course creator, an online agency, or a large company, like Google or Facebook. On the personal branding side, it’s focused on people who are looking to build a personal brand rather than a company approach to site building. Now, marrying and integrating these two will help in reaching and filtering out the people who are a good fit and would benefit most from the course versus those who would not. Anyway, I wanted to share this with you because I know how challenging it can be when you’re trying to outline and plan for your first online course. If you have any questions or recommendations in outlining strategies or tools, go ahead and leave a comment below. I’d love to hear what you think.